This fruit is found in many countries across Asia. They are well loved, not only for their vitamins, but we also believe in their auspicious effects. For Example Chinese believe that Pomegranate is a sign of fertility, so they usually give this fruit as a wedding gift for the bride. In North-eastern Thailand it is call Pi-La and we plant them by the gate as to protect the home from the bad spirits. This is co-incidentally similar to the Japanese Culture. 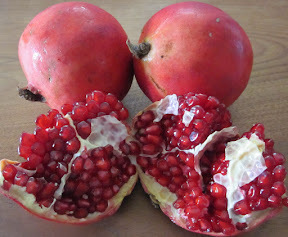 Pomegranate is rich in Vitamin C and it is good to quench the thirst with or to cool down your body and the shell of the fruit contains tannin, which is good for healing the wound. It also helps in stopping diarrhea.